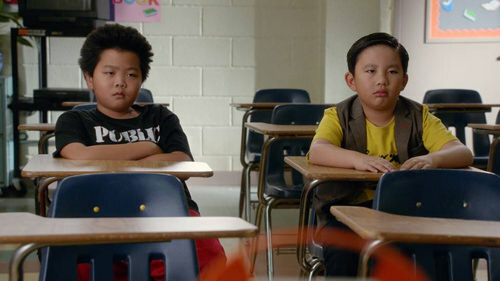 A fundamental story pattern on “Fresh off the Boat” has emerged. Eddie’s hip-hop clash is the New American Asian Fusion that sets off the comedic and leads us over the bridge to racial harmony!It all came into focus this week when Eddie gets automatically paired with a new student, an adopted Chinese Jewish cello nerd. Somehow school principals have this basically racist instinct that not only do all Asians look alike, but we all must like the same things–including people who look like us. We know the march is not yet over. We know the race is not yet won…There’s nothing America can’t handle if we actually look squarely at the problem. And this is work for all Americans, not just some. Not just whites. Not just blacks. If we want to honor the courage of those who marched that day, then all of us are called to possess their moral imagination. All of us will need to feel as they did the fierce urgency of now. All of us need to recognize as they did that change depends on our actions, on our attitudes, the things we teach our children. And if we make such an effort, no matter how hard it may sometimes seem, laws can be passed, and consciences can be stirred, and consensus can be built. Getting to that consensus is the hard part. Do we have that moral imagination? Maybe that’s where the young come in. The president wasn’t aware of all the SAE nonsense. But his speech was a pitch to our youth:“You are America. Unconstrained by habit and convention. Unencumbered by what is, because you’re ready to seize what ought to be. For everywhere in this country, there are first steps to be taken, there’s new ground to cover, there are more bridges to be crossed. And it is you, the young and fearless at heart, the most diverse and educated generation in our history, who the nation is waiting to follow.”Historian Douglas Brinkley on CNN called the speech Obama’s “I Have a Dream” speech for the 21st century.For me, I found re-reading the speech again this week comforting and poetic, a vision of the America that can be. I do think it will be the speech America’s first black president will be remembered for. More than empty rhetoric, it’s a helpful reminder for when news like the SAE chant and all the Ferguson stuff gets in the way.The news doesn’t have to derail us.As young Eddie shows us on “Fresh off The Boat,” there’s lots of ways to cross a bridge to lead us to common ground. The Beastie Boys? Sure, why not?In the perfect world, let’s imagine Eddie lock-armed with William Kristol, who could be heard saying, “This is the illest.” Now that takes some moral imagination.